TORONTO, ON – October 24, 2018 – Make getting there fun, with the 2019 Toyota Highlander. Available in conventional and self-charging hybrid powertrains, with room for seven or eight adults, the Highlander features a range of models and grades that let you pick the vehicle that suits your style. Regardless of your choice, every Highlander delivers tremendous comfort, performance, style, technology and safety. The 2019 Highlander makes a positive first impression with a refined exterior, featuring elegant front and rear fascia designs, LED tail lamps, a rear spoiler, and alloy wheels. XLE and Limited models include a remote operated power rear door with jam protection, plus flip up rear door glass and a sunshade. Inside, the Highlander offers seating for seven or eight adults in a cabin that’s spacious and modern. All models are well equipped with many standard features that enhance comfort and convenience. The conventionally powered Toyota Highlander is offered in two choices – front wheel drive and all wheel drive with an active torque control system and downhill assist control. These Highlander models feature a 295 peak horsepower 3.5 L V6. XLE and Limited trim levels include an engine stop and start system to further enhance fuel efficiency. This engine is matched with an eight-speed direct shift automatic transmission, while the powertrain features hill start assist control. Drivers may also choose the Highlander Hybrid, built around the most popular and proven self-charging gasoline-electric powertrain on the planet. This 306 net horsepower Toyota Hybrid Synergy Drive is specifically tailored to the Highlander Hybrid, featuring a 3.5 L V6 and high-torque electric motor/generator. Power is applied to the four wheels through an electronically controlled continuously variable transmission for confident acceleration and remarkable fuel efficiency – at just 8.3 L / 100 KM (city/highway combined). Electric power steering, a front suspension featuring MacPherson struts, and a double wishbone rear suspension with trailing arms enhance responsiveness, control and ride comfort. Toyota is committed to offering Canadians the most advanced bundle of in-vehicle technology and connectivity services. All 2019 Highlander models feature a display audio system with voice recognition, USB audio input, Bluetooth® connectivity, SIRI Eyes-Free, steering wheel-mounted controls, four USB charging ports, and more. Of course, the Highlander wouldn’t be a Toyota without delivering impressive safety performance: Toyota is committed to making the road safer for all users and to leading the industry with innovative safety technology that’s available to all. Highlander’s extensive list of safety technologies is headlined by Toyota Safety Sense P. This bundle of advanced systems includes the Pre-Collision System with Pedestrian Detection function, featuring forward collision warning and automatic emergency braking… Lane Departure Alert with Steering Assist function… Automatic High Beams… and Dynamic Radar Cruise Control. Other standard safety features include the six active technologies of the Toyota Star Safety System, eight airbags, a backup camera, and a tire pressure monitoring system. Highlander Hybrid models, which may run almost silently in electric vehicle mode, also feature a vehicle proximity notification system to alert other users of the road to their presence. 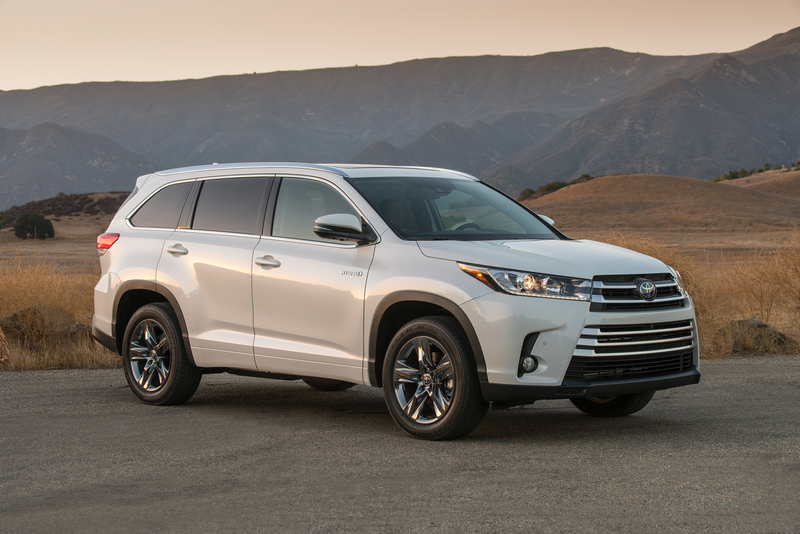 The 2019 Toyota Highlander LE (Starting MSRP: $37,000) maximizes efficiency with its front-wheel-drive power train. New for 2019, this eight-person model now sports a black lower rocker panel. Other features include a six-speaker 6.1” Display Audio system, a 3.5” multi-information display, dual zone climate control, 18” alloy wheels, and more. The 2019 Toyota Highlander LE AWD with Convenience Package (Starting MSRP: $43,440) adds the engine stop and start system, three-zone independent automatic climate control, an eight-way power adjustable driver’s seat, cloth and Softex seating material, heated front seats, a power rear door with jam protection and flip-up hatch glass, an 8” Display Audio system with integrated Sirius XM Satellite Radio, leather wrapped steering wheel and shift knob and fog lamps. The 2019 Toyota Highlander XLE AWD (Starting MSRP: $45,495) features room for eight adults, with a 60/40 split folding second row seat. Other features on this model include a six-speaker 8” Display Audio system with the Driver EasySpeak system, AVN Premium Navigation, three-zone independent automatic climate control, an eight-way power adjustable driver’s seat and four-way power-adjustable front passenger’s seat, a 4.2” multi information display, electro-chromatic rear view mirror, leather seating, leather-wrapped steering wheel and shift knob, the Toyota Smart Key System with Push Button Start, keyless entry with hatch release, a power rear door with jam protection, flip-up hatch glass and rear door sunshade, an anti-theft system, chrome accents on the rear bumper, silver painted roof rails, a power moon roof, 18” alloy wheels, LED daytime running lights, fog lamps, and more. The 2019 Toyota Highlander SE AWD (Starting MSRP: $47,405) is the sportiest Highlander – featuring a sport-tuned suspension and second-row captain’s seats for maximum comfort for up to seven adults. Sporty styling cues provide an aggressive presence – including unique 19” black alloy wheels, painted black roof rails, ambient lighting and unique sport interior trim. New for 2019, this model’s styling is further enhanced with LED fog lamps, a black SE edition badge, painted black sport grille, and non-plated black headlamps. For a more luxurious experience enhanced with intuitive technologies, the 2019 Toyota Highlander Limited AWD (Starting MSRP: $51,800) accommodates seven adults in remarkable comfort, including heated and ventilated front row captain’s seats, second-row heated captain’s seats, and premium perforated leather seat cladding throughout. Other features include a 12-speaker, JBL Synthesis 8” Display Audio system with the Driver EasySpeak system, heated, leather-wrapped steering wheel, Birds Eye View monitor, a dynamic back up camera, front and rear clearance sonar, LED ambient lighting, a panoramic glass roof, roof rails with chrome trim, 19” dark chrome clad alloy wheels, rain-sensing wipers, memory-mirrors with puddle lamps, fog lamps, smoked headlamp surround, and more. The 2019 Toyota Highlander Hybrid XLE (Starting MSRP: $50,950) features room for eight adults, with a 60/40 split folding second row seat. Other features on this model include a six-speaker 8” Display Audio system with the EasySpeak system, AVN Premium Navigation, three-zone independent automatic climate control, the Toyota Smart Key System with Push Button Start, keyless entry with hatch release, a power rear door with jam protection, flip up hatch glass and rear door sunshade, a power moon roof, 18” alloy wheels, LED daytime running lights, fog lamps, and more. Combining efficiency with luxury, the 2019 Toyota Highlander Hybrid Limited (Starting MSRP: $57,260) accommodates seven adults in remarkable comfort, including heated and ventilated front row captain’s seats, second-row heated captain’s seats, and premium perforated leather seat cladding throughout. Other features include a 12-speaker, JBL Synthesis 8” Display Audio system with Premium Navigation, heated, leather-wrapped steering wheel, leather-clad shift knob, keyless entry with hatch release, Birds Eye View monitor, a dynamic back up camera, front and rear clearance sonar, LED ambient lighting, a panoramic glass roof, roof rails with chrome trim, 19” dark chrome clad alloy wheels, rain-sensing wipers, memory-mirrors with puddle lamps, fog lamps, smoked headlamp surround, and more.. New for 2019, this model now includes LED fog lamps. The 2019 Toyota Highlander and 2019 Toyota Highlander Hybrid are now on sale at Toyota Dealers across Canada. For complete and up to date details and specifications, visit www.toyota.ca/highlander.